How’d you like that All-Star Game? Are things heating up for your favorite team? 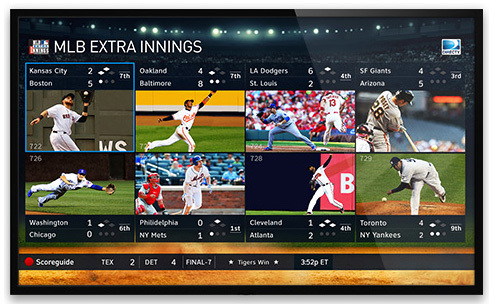 If you want more baseball action, you’re in luck: DIRECTV has a massive MLB Extra Innings Free Preview this weekend! You’ll get every game free in the 700s plus the game mix channel and strike zone channel free from July 14 through July 20. Now’s your chance to see the cool stuff on DIRECTV! DIRECTV’s NFL Sunday Ticket usually gets all the press, but its Extra Innings package is just as impressive. You’ll get (almost) every game live from both the home team and away team’s sports channels, plus watch eight games at once with the HD mix channel. Why (almost) every game? Well, DIRECTV has to abide by the league’s fairly bizarre blackout rules so if the game isn’t available in your area you obviously won’t be able to watch it. If it’s featured on the Mix channel you can usually watch it that way although the image will be very small. Also, it’s worth noting that DIRECTV still doesn’t carry Sportsnet LA, the channel dedicated to the LA Dodgers… but can you blame them? Even now, several months into the season, no new pay-TV companies have signed up to carry that channel because the price is ridiculous. Plan for a big weekend of baseball and enjoy it all… courtesy of DIRECTV. If you find out that you love it, then go to directv.com/mlb to order the rest of the season at a special price! Hey, does anyone still use converter boxes?